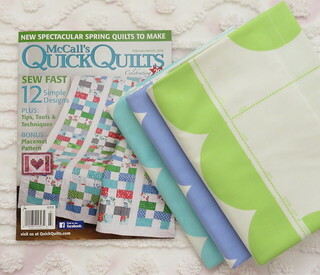 Are you following along with Holly's Two by Two quilt in McCalls's Quick Quilts? The second installment is out in the February and March issue available now! Hope that you're playing along with us. 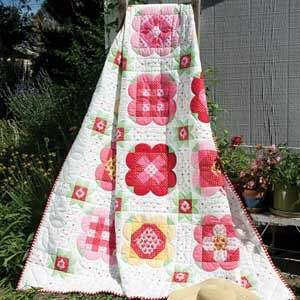 The quilt is quick and easy to make. The scallops make these simple blocks have a big impact with none of the drama of sewing them! I stitched this together for Holly and believe me its easy sewing! Ok, hope you guys are having a great week! I'm off to CHA with a side of Disneyland thrown in. Looking forward to meeting up with Roseann to see what kind of trouble we can get into! Time to soak up some inspiration! And hopefully the rain breaks enough for us to head into Disneyland for the day too! You're right down the street! Have a ball and find all the cute things to show us. I went to Holly's blog after the magazine came out, she hasn't even posted about it. I'm glad you are to keep us up to date! My copy arrived in the mail last week! I'm plotting my fabrics for these cute blocks. Have a GREAT trip! Disneyland ? Please have a ride in the cups and take a photo !